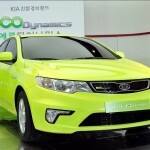 South Korean manufacturer of vehicles, Kia Motors, will launch for the Korean market first hybrid of the mark which will be come into mass production, as the Kia Forte LPI Hybrid. 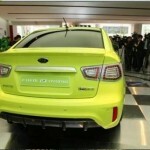 This car falls under the brand Eco-niche of the Dynamics of Kia and will work on gas and electricity. The new model uses a 1.6 liter engine and 114 horsepower that operate on liquefied petroleum gas, with help from an electric motor generating 20 HP. These two units to get the 5.8 liters per hundred kilometers traveled. The battery is supplied from the LG Chem, which supplies the same type of hybrid units for Hyundai Elantra, Sonata, and Chevy Volt. It is possible that the car in question to be sold in China, and about placing on the markets of Europe and the United States is not heard nothing yet.